Apple has made no secret that it is moving away from 32-bit applications to the new world of 64-bit. But, how can you tell which applications are in jeopardy? It’s easy and here’s how. From the Apple logo, choose About This Mac. Click the System Report button. In the sidebar on the left, scroll down until you see the Software category, then click Applications. After several seconds, a list will appear on the right of all the applications installed on your system. There will be a LOT and many of them you may not have heard of because the software you use relies on a variety of helper applications which are not normally visible. Click the name of an app, to learn more about it. Click the 64-bit (Intel) column header at the top left of the window to sort all the 32-bit applications together. Reviewing your list of software now will give you a better understanding of what will go away when Apple finally stops supporting 32-bit applications. More time to plan is always better. For media professionals, many of our older audio and video codecs are only 32-bit. I have not yet been able to get word from Apple on what happens to these when the transition to 64-bit is complete. For now, there’s nothing you need to do. 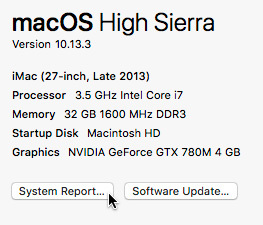 Sierra and High Sierra still support most 32-bit applications. However, future versions of the macOS won’t. So, consider this a heads-up that allows you to better plan for the future. It says Compressor 4.4 is not 64 bit. Will Apple be upgrading that or abandoning it? Interesting – you are correct, this flags Compressor as 32-bit. No, Apple will not be abandoning it – it is essential to the operation of Final Cut Pro X. Like all other developers, Apple will be updating it – at some point – to 64-bit. Many of the files listed by using this method do not show up using the FIND command. Is there a way to find and delete at least the duplicates? The easiest way to find them is to use the information in the Location information displayed when you select the file. Also, I wouldn’t delete anything yet – wait until you get closer to actually updating to the next version of the macOS. The best thing to do right now is to be aware of the applications that are in jeopardy. This gives you time to upgrade them, assuming you still need them. Otherwise, the next OS will simply turn them off.